Kathmandu Durbar Square is one of the most popular tourist destinations as enlisted in World Heritage Sites. Clustered around the central Durbar Square are the old Royal Palace (Hanuman Dhoka), numerous interesting temples, the Kumari Chowk or Kumari Bahal (House of the Living Goddess) and the Kasthamandap (House of Wood) from which Kathmandu derived its present name. An exquisitive exploration in the Durbar Square reveals the ancient art and architecture of Nepal. Situated 5 kilometers east of Kathmandu City, Pashupatinath temple is one of the holiest temples dedicated to Lord Shiva. Situated amidst a lush green natural setting on the bank of the sacred Bagmati river, the temple built in pagoda style has jilted roof and richly carved silver doors. Visitors are permitted to view the temple from the east bank of Bagmati River, as entrance into the temple is strictly forbidden to all non Hindus. Pashupatinath is the centre of annual pilgrimage on the day of Shivaratri which falls in the month of February/March. 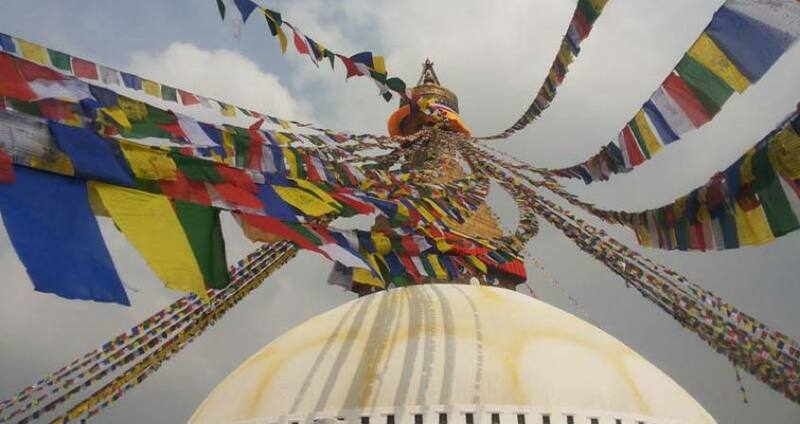 This Stupa, situated 8 kilometers east of Kathmandu city, is one of the biggest stupa in the world. It stands with four pairs of eyes in the four cardinal direction keeping watch for righteous behaviour and human prosperity. This Buddhis Stupa was built by King Man Deva at the advice of the Goddess Mani Jogini. It is built on an octagonal base inset with prayer wheels. The shrine is encircled by houses of Lamas or Buddhist priest. Swayambhunath is located approximately 4 kilometers and this Buddhist Stupa is said to be 2000 years old. The Stupa which forms the main structure is composed of a solid hemisphere of brick and earth supporting a lofty conical spire capped by a pinnacle of copper gilt. Painted on the four sided base of the spire are the all seeing eyes of Lord Buddha. This hill is a mosaic of small Chaityas and Pagoda temples. Day 01:7.30AM Drive to Pashupatinath Temple for Pashupatinath Temple tour. 10.00AM Tour to Boudhanath 11.00AM Lunch at Boudhanath 12.15PM Drive to Swayambhunath or Monkey temple tour 2.15PM Tour to Kathmandu Durbar Square 4.30PM Drive back to your Hotel. Day 17.30AM Drive to Pashupatinath Temple for Pashupatinath Temple tour. 10.00AM Tour to Boudhanath 11.00AM Lunch at Boudhanath 12.15PM Drive to Swayambhunath or Monkey temple tour 2.15PM Tour to Kathmandu Durbar Square 4.30PM Drive back to your Hotel.